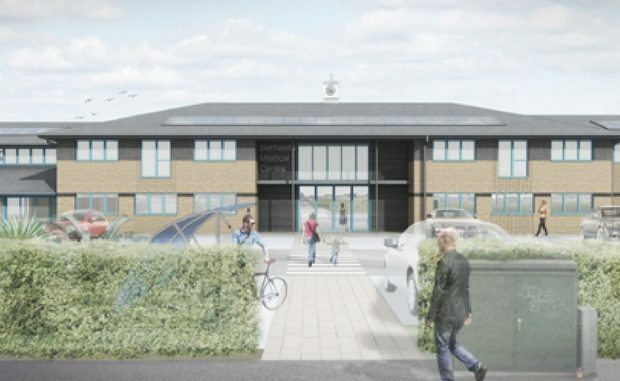 A planning application for the £6.5million extension of the Bethesda Medical Centre in Palm Bay is expected to be approved by Thanet council tomorrow (June 20). The plans, revealed by The Isle of Thanet News last December, are to create a new “one stop shop” for people in Margate which can cater for up to 32,000 patients, allowing them to get medical and nursing services in one place. If approved, the Bethesda centre will include specialist clinics for physiotherapy, audiology, ophthalmology, ultrasound and minor surgery, for patients from Margate and beyond – services which are currently only available in hospital. The plans are for the centre to also have a gym for physio, an outside gym area, a bigger pharmacy, allotment space, a café and a community kitchen. It would be open evenings and weekends. The new building will include space for teams of healthcare professionals to meet and to work together, including GPs, nurses, community, social care and mental health professionals and workers from voluntary organisations, where they can co-ordinate treatment for patients with complicated health needs. The new facility, which will double in size from 12 consulting rooms to 24, would also provide education and training space for medical staff, which could be used by patient groups too. According to documents lodged by Deacon and Richardson Architects the facility will also almost double parking spaces from 51 to 100 after securing the existing coach park. Plans reveal the Margate Task Force will also relocate to a new PCH Hub, which along with its own consulting spaces and minor surgery suite, will contain public educational services, an integrated multi-disciplinary team, and an administrative office for the task force. The build will take place in four phases, allowing the main medical centre building to remain in operation while the large extension to the east is built. The remodelled centre is expected to be complete by 2020. In the design document the architect states: “The existing medical centre, while fit for purpose, is now undersized for the number of registered patients (originally designed for 12,000 but now up to circa 19,000 following the closure of Union Row). “With the merging of Northdown and Bethesda surgeries, plus additional much-needed services that will be located in the new centre, it is predicted that the patient list will grow to 32,000 by 2022 and this will require comprehensive facilities. There have been four public objections and a holding objection from Kent County Council Highways and Transportation which says amendments should be made to a planned zebra crossing and parking provision should be re-examined. Members of Thanet council’s planning committee will discuss the application tomorrow. The planning officer in charge of the application has recommended it for approval. The proposal is part of wider plans to create three GP ‘practice groupings’ in Thanet, each serving between 30,000 and 60,000 patients, reported by The Isle of Thanet News in January. The initiative is part of the Sustainability and Transformation Plan (STP), created by Kent and Medway health trusts, the NHS, Kent County Council and Medway Council, which sets out proposals to overhaul the health system, including changes to GP surgeries and hospitals. The STP says extended GP practices will provide enhanced in-hours primary care and enable more evening and weekend appointments and hubs – with an even greater patient capacity – will offer multi-disciplinary teams delivering physical and mental health services locally at greater scale and seven day integrated health and social care. Original proposals were for four GP groupings – dubbed Primary Care Houses (PCHs) – made up of the villages, Broadstairs; Margate and Ramsgate. New proposals reduce that to three by combining the villages and Broadstairs (Westwood). Find out more about the proposals here. How many of the 100 car parking spaces will be for patients given there will be dozens of staff cars using spaces and will there be a stealth tax on parking there for being ill? And how long will these hubs take to sufficiently hollow out services at Margate QEQM allowing it to be downgraded and its A & E closed. Ask yourself this one question – is my GP practice safe from cloure?